Betrayers of Kamigawa, Rare. 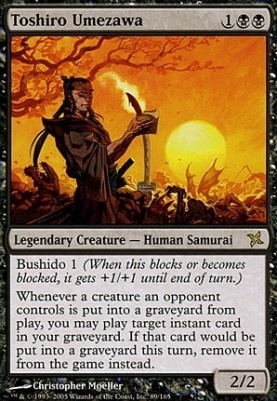 Fun factoid: Toshi here was the first protagonist in MTG history to be represented by a mono-black card, but, funny enough, his existance in the MTG story timeline predates all other Legends I can think of (including the Legends set, actually). It seemed that the other colors passed around the spotlight when it came to who had the hero. White had Gerard Capashen, Blue had Urza (errr… Blind Seer, but it is difficult to express the terrifying power and awesome of Urza, the Chuck Norris of MTG, in an era before planeswalker cards), Red had Kamahl, Pit Fighter, and then he went to Green as Kamahl, Fist of Krosa. So, for the first 12 years of MTG, Black was a color for bad guys exclusively. I think this was a gross injustice, but I don’t want to get into my beliefs about the colors and what they represent thematically (Maybe that’ll be in an article in the future!). Mr. Umezawa seems to enjoy watching his opponent’s creatures die. Not very heroic of him, but that just makes it better for us. When a creature an opponent controls dies, you get to treat any instant in your graveyard as though it had flashback. That’s pretty awesome. Heck, if an instant that you’re casting kills something (i.e. Terror), you can flash it back as soon as it resolves. Our mono-black, heroic Samurai is quite the spell-slinger.